conveniently small space. This is super handy for boat living where storage space is generally limited. 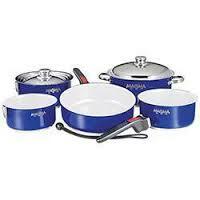 Magma cookware is really the gold standard when it comes to boat cookware. It's what most people use. I'm not sure if that is because it is the best, or if it is because of Magma's name recognition from it's very popular boat grills. I think the thing I love most about the Magma cookware set is that it comes in both non-stick ceramic and stainless steel. I also like that there are some options on the exterior finish, either polished stainless steel or a really nice blue color. I don't like the weird lid. It's a smart design to reduce the number of lids required, which I do appreciate. I hate having a million lids. However, I don't like that the Magma lid is either going to overhang on smaller cookware, and dip down into larger cookware. I think the Neoflam Midas set does a better job having "normal" lids. I spoke with a number of people using Magma cookware, and everyone basically raves about them. Several people mentioned that these are heavy duty pots and pans, able to stand up to daily use and abuse for years. 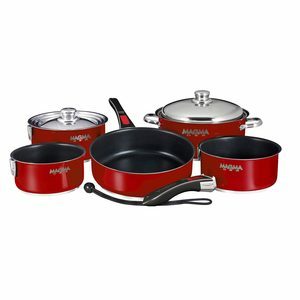 I think you really can't go wrong with Magma cookware. It's a safe bet that is comparable in price and quality to a "normal" set of household cookware. I also think it's awesome that they give you two handles with the 10-peice cookware set instead of just one. 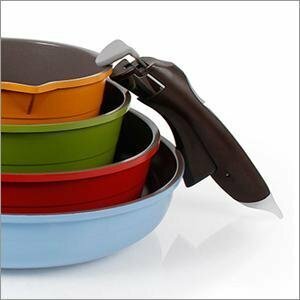 Neoflam Midas is a nesting cookware set with detachable handles. This comes in super handy on boats where space is limited. 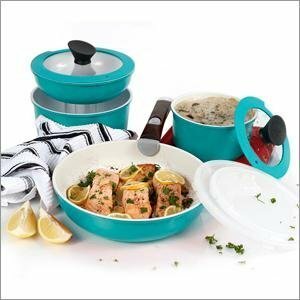 The Neoflam Midas cookware comes in a fun colors: Emerald Green, Sunrise Red, or multicolor. I really like the handle style, which can be attached at any location on the cookware. 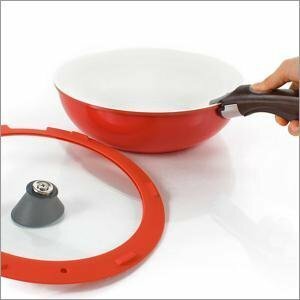 Compare this to the popular magma cookware which has a specific attach point that could be challenging if you have to detach/reattach on a hot pan. If using a pot or pan in the oven, the grab and grip handle style of Neoflam looks quick and easy compared to trying to fit a handle into a keyhole on a hot pan while on a rocking boat as you lean into a hot oven. 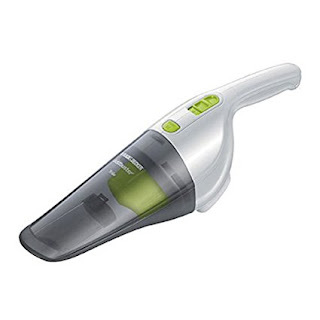 A Neoflam replacement handle is also about half the cost of the Magma set. I also really like that these nesting pots and pans come with a plastic lid, so the cookware can double as food storage containers. The tempered glass lids are rimmed with silicon which is handy for reducing vibration noise when motoring. There's not much to not like about the Neoflam Midas cookware. I don't like the ceramic non-stick coating. I'm probably alone in this. Everyone seems to love non-stick, but I love taking a metal scrubby to polish up stainless steel pots and pans. I have used a metal scrubber on a ceramic pan and it didn't seem to damage the ceramic coating, however I'd be concerned about doing this regularly. One thing I think Neoflam really got right is their "Ecolon" nonstick coating is made from all-natural materials. 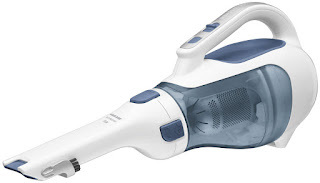 It's PFOA and PTFE free. Honestly, I have no idea what the hell that means, but my hippie wife has warned me on more than one occasion about the chemical dangers of non-stick coatings. I think it's safe to assume boaters lean toward the "natural" side of things, so this Ecolon coating is a good call. I also don't like the bowl like shape of the pots and pans. Honestly the bowl shape of the 10" frying pan is probably my main dislike of the Neoflam cookware. This nesting cookware set looks pretty great. 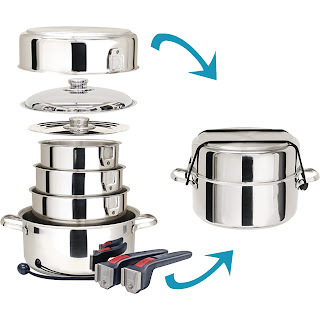 In my quest to find the perfect compact cookware for boating, I'm seriously considering buying this set. If you have purchased Neoflam Midas pots and pans, please let me know how you liked them!